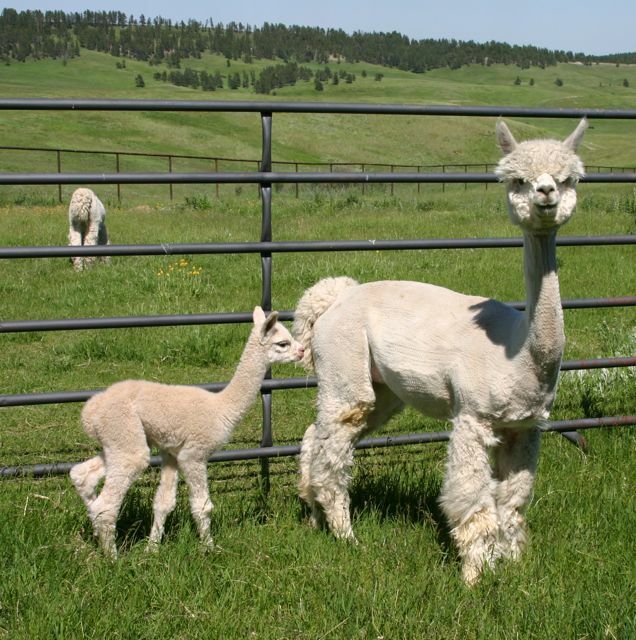 We offer a comprehensive ranch guarantee on every breeding animal sold, plus the Cloud Dancer 30 day, full money back guarantee that makes your alpaca purchase a "no worry" affair. We also provide full disclosure so you can rest assured you know all there is to know about each and every animal we offer for sale. We hardly need to add that we offer excellent quality alpacas for very reasonable prices, and we are a voluntary signer to the alpaca breeders ethics policy, which is available on request. ​From Augusto and Legacy to Don Julio and Snowmaster, this girl's pedigree does not leave anything to chance. And just look at the result! Swingtime is a nice-sized girl with a sweet personality. Her fiber is her glory - a strong even crimp, very nice staple length, lots of brilliance and fine, fine, fine. Get your hands on her and see what we mean! Swingtime is 8 years old, and in her prime breeding years. After 21 years in the industry, we are starting to downsize our herd and are not breeding much any more. She really needs to go to a farm where her great genetics and potential can be put to use. We will gladly add a complimentary breeding to any of our herdsires, and, of course, Swingtime sells with full reproductive warranties. ​Macarena's sire is the multiple-winning true black champion, CCNF Cameron. 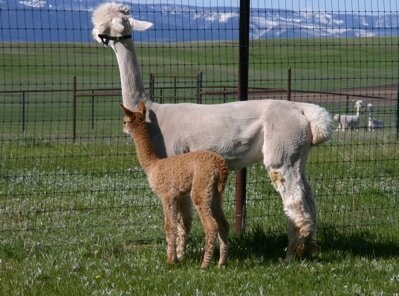 Her dam is a beige female from the Snowmass lines that we bought for her extremely fine fiber and excellent conformation. 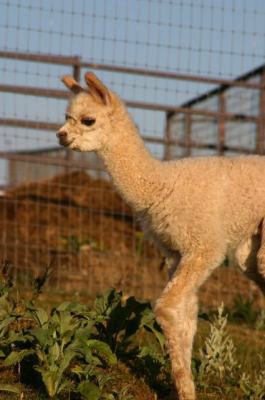 Macarena is a spunky girl with great conformation and an outstanding fleece. She has tons of presence is quite eye-catching. 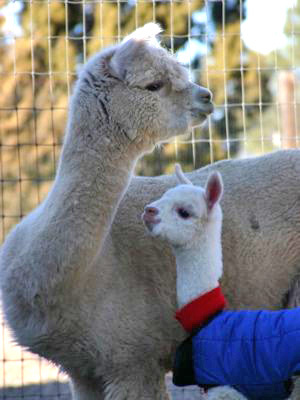 Her first cria, MacDango, is now a herdsire for a ranch in North Carolina (that's him in the photo on the right, above). Macarena is a great mother and very attentive to her crias. Macarena sells bred to any of our herdsires, with our rock-solid guarantees. Do yourself a favor and grab this girl! She is only 7 years old and really should be in use on a ranch that is doing more breeding than we are these days. Austine is one outstanding female, and one that will bump your breeding program up a notch. This pure Bolivian gal was the high selling female at the 2003 Futurity auction. 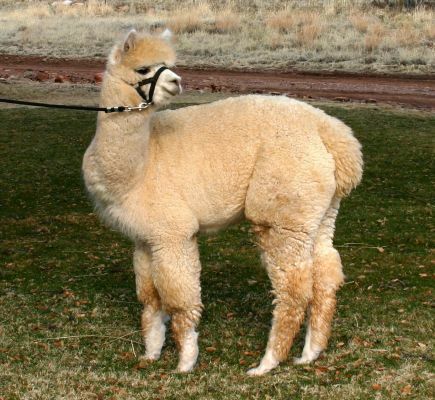 Her pure Bolivian pedigree is something that doesn't show up on the sales lists very often, and her sire, Bolivian Chieftain is a well-known producer of champions from the Alpacas of America breeding program. Austine is a proven dam, and an excellent mother. She has produced several crias with stellar histories: her first cria, daughter Dulce de Leche, was champion in every show she entered, and sold for $30,000. Son Lock & Load, owned by Desert Mountain Alpacas, has been producing his own line of champions since he started breeding. She still has some breeding years left and can do a lot of a discriminating breeding program. Austine is 16 this year, but still has a few years of good breeding left. Why not pick her up and add some new genetics to your program? We will offer a complimentary breeding to any of our herdsires, if the buyer desires. A daughter of our own Macho Colorado, we have greatly enjoyed April's quirky nature and her ability to produce outstanding crias. With great conformation and holding onto below average fiber fineness, we appreciate her strong genetics, too. April is a great mother and takes very good care of her babies. 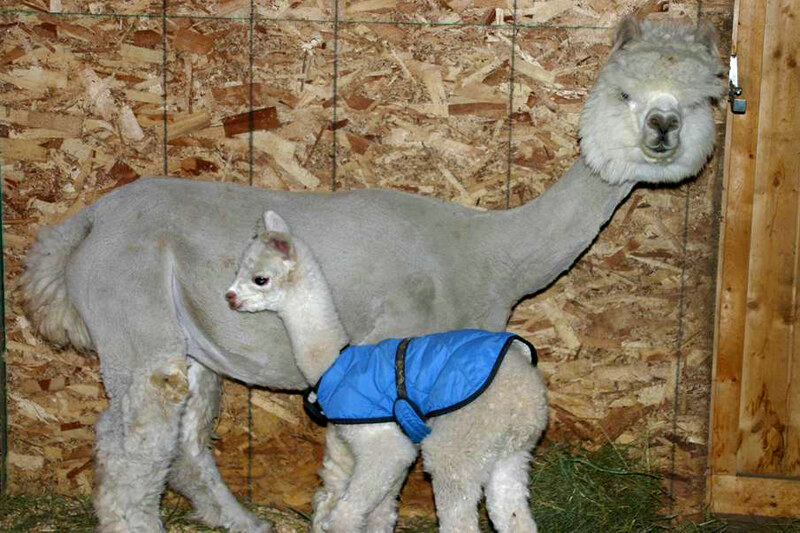 Her first cria, Winter Fandango, is now serving as one of our herdsires after taking color champion in his first show. April tends to throw fawns, which is a color we love. April has excellent conformation and is a nice sized girl. She births easily and loves her babies. Her fiber is very uniform with a bold crimp style. Her fiber coverage is above average. At 14 years of age, April still has a few good breedings left in her. Why not grab her and put her to use in your herd? We are offering April with a free breeding to any of our herdsires, and with full reproductive warranties. We sure wish we had a reason to keep Secoya and keep breeding her to top studs, but it is time to let her go. She has several more good breeding years ahead of her, and will be a huge benefit to someone's breeding program. Let our loss be your gain!